I have a good number of north Indian acquaintances, many of them in and around Delhi. Most are Bengali by birth, but have transformed to become Punjabi or Jathi or Delhi-ite or even probasi Bangali as seasons and situations demand. The trouble is they can neither forget bangaliana (by that I mean the ‘cultural leanings’ of Bengalis) nor embrace the other identity – whatever that is – with wholesome conviction. Being neither here nor there is rather awkward I daresay, and this comes to the fore whenever Bengalis as a jati fail, which admittedly they do rather frequently these days. The confusion though on what’s good and what’s not sifts continually through the mind, but perhaps nothing is as persistently stubborn as choosing between rice and roti. If a fellow north Indian Bengali has something bad to say about Bengalis from Bengal, there is every chance that the term bheto bangali (or, ricey bangali, if you may) will find the pride of place in his choicest expletives. Oh sure it is…not by sentiments but by facts. And what do the facts say? Well, starting from the northeast right across the length of the country up to Kerala, for a vast majority of Indians rice is the staple food. The irony is many Bengalis in Bengal love eating rotis either in lunch or dinner, but others eat just rice. Why only India? 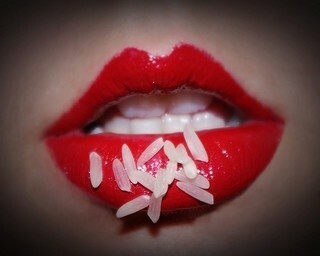 People in Bangladesh and in the entire east and southeast Asia including Japan and parts of China mainly eat rice. I once inquired about roti in Singapore and immediately wished I hadn’t. It’s as futile to look for veg dishes in any of these countries as for roti. It’s not that I didn’t know all of these, but a recent Vir Sanghvi article, Our Rich Rice Legacy, fueled my intense desire to put things in perspective. Vir is my favourite writer for his no-nonsense articles and I have several of them in this blog. But his Rude Food column in the Hindustan Times clearly stands out as a great reading every Sunday. All over north India, basmati is the only breed that counts; everything else is regarded as inferior. In the south, they are less respectful of basmati and far more knowledgeable about rice varieties. But for all this nonsense about fair, wheat-eating Aryans and north Indians, the reality is that rice was really the staple food of north India. It did not actually reach south India till 1,000 BC or many, many centuries after north Indians had been cultivating it. In contrast, wheat, which north Indians are so proud of, came to India from the Middle East and is not our own grain at all. Somehow, the notion of brave Aryan warriors fighting and banishing the Dravidians (largely mythical but widely subscribed to in north India) seems less compelling when you realise that after these fair-skinned horsemen had finished with battle they probably sat down to a meal of curd rice (or perhaps payasam to give them some energy). For this, I lay the blame entirely on north Indians. First of all, they subscribe to all this Aryan-wheat-eater rubbish which has no historical basis. And when the Muslim kings and emperors arrived, north Indians quickly abandoned their own rice tradition and became slaves to the rice dishes of people from Central Asia and the Middle East who knew nothing about rice. But the worst thing north Indians have done is to elevate basmati to the status of king of rice. It is considered cheap to serve any rice other than basmati to guests and all that Mughal court nonsense about rice (dreamt up by people who were essentially rice-illiterates) prevails. But north Indians are prisoners of their prejudices, willing and credulous followers of traditions established by ignorant Central Asian dynasties who knew nothing about rice. So there you are. Talking of basamati, fortunately I never ask for it in a rice shop if I know it has Gobindobhog in stock, or even Dudheswar for that matter! Coming to think of it, don’t you agree food is an important component of one’s culture? Well in that case, what is that culture that imitates and then boasts of other cultures? Featured image courtesy Alexis Breaux at Flickr. 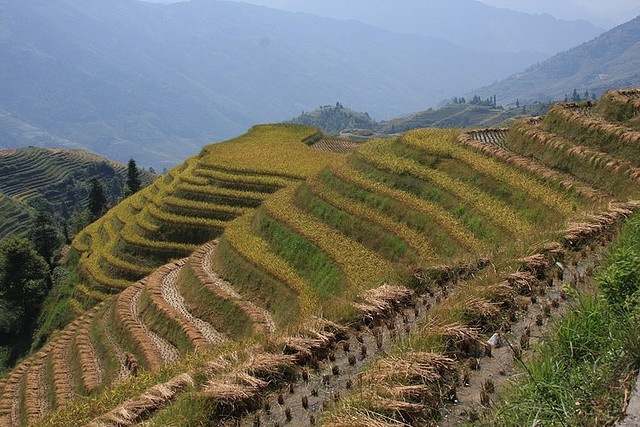 Image of the rice fields in China courtesy Joan Vila at Flickr.